Tonbridge has excellent train links to London and other parts of Kent and the South East. Tonbridge station is located in the centre of the town. 35 minutes to London or 44 minutes to Dover and the continent. Tonbridge is Kent's busiest railway station with 3.8 million passengers passing through the station. Tonbridge is located in the West of Kent and has great bus links to the other larger towns in the area, Maidstone, Tunbridge Wells or up to Bromley, Bluewater. 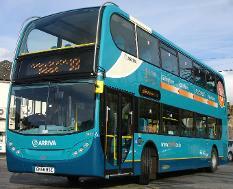 For route and times, check out the Arriva website below. Tonbridge has a taxi rank located at Tonbridge station in the heart of the town. Tonbridge is connected to the M25 by the A21 trunk road which takes drivers 10 minutes to reach the M25 from the South end of the town. It is also connected to other towns in Kent via the A26 which links Tonbridge to Maidstone in the East and Tunbridge Wells in the east. The A21 road between Tonbridge and Pembury is finally going to made into a dual carriage way following the government announcement to widen it into a bypass. The Highways agency has confirmed funding is now available and the work will start in 2012. Prior to the work commencing take a look at what the A21 currently looks like. A21 dualling still under way.